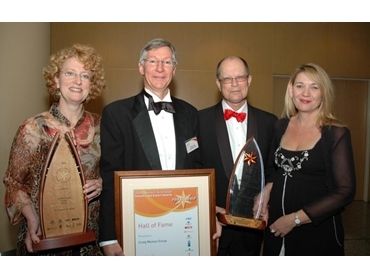 Craig Mostyn Group (CMG) has been inducted into the Western Australian Industry and Export Awards Hall of Fame, having last week won the prestigious Agribusiness Export Award for the third successive year. Head-quartered in Fremantle, the company is a successful and diversified food, agribusiness and logistics company, servicing more than 60 countries worldwide. The WA Industry and Export Awards, now celebrating its 20th anniversary, feature 15 industry and export categories, in addition to the Premier’s Award for Excellence. Along with the other State export category winners for 2008, CMG now automatically competes as a finalist in the Australian Export Awards in Melbourne in December. Administered by the Department of Industry and Resources, the 2008 WA awards are endorsed by The Australian Institute of Export, Chamber of Commerce and Industry WA, Chamber of Minerals and Energy and Unions WA. Premier, Colin Barnett said his Government was very aware of the importance of WA’s export capability and capacity, with the state responsible for 36 per cent of total Australian exports. He also referred to Singapore as a particular WA export focus. Responding to the Premier, CMG Chief Executive, David Lock, said receiving a third successive agribusiness export award and the subsequent Hall of Fame induction, was an honour and a reflection of the dedication of all 450 CMG staff. Mr Lock also highlighted that the team at CMG’s PPC Linley Valley Pork business at Wooroloo would soon be extremely busy integrating a large acquisition. Accredited with AQIS, AUSMeat, HACCP and NASAA, PPC/LVP exports fresh pork to Singapore, New Zealand, Thailand, China, Hong Kong, Korea and USA. PPC/LVP is a very significant exporter of pork into Asia, with about 20 per cent of Australian pork exports into the Asian region and 50 per cent of Australia's fresh, chilled pork into Singapore coming from PPC's Establishment 618. Mr Lock said the company’s strategy has always been to develop trust and confidence with all stakeholders, particularly working closely with its quality assured pig suppliers in WA and its customers in Singapore. CMG has in the past 12 months invested in three pig farms in WA, to ensure PPC/LVP maintains supply and critical mass to service important export markets. “Our 1200 sow breeder unit at Gingin, operated in conjunction with our 10,000 head grow-out facility at Red Gully/Mogumber, plus our very recent purchase of Wandalup Farms, a 4000 sow piggery, should ensure not only a steady supply base, but a strong platform for future growth for the industry. “From genetics to feed composition, we work closely with our growers to ensure they produce the highest quality pigs,” he said. Mr Lock noted that CMG, having successfully owned and operated WA’s only export pork abattoir, now has the confidence and reputation to plan a new sheep and beef abattoir, which would be the first in WA for 35 years. “Again, like PPC/LVP at Wooroloo, it would be state-of-the-art and would help support sheep and beef producers across the state,” he said.